Other names: grootsuurpruim, umThunduluka-obmvu, morokologa. 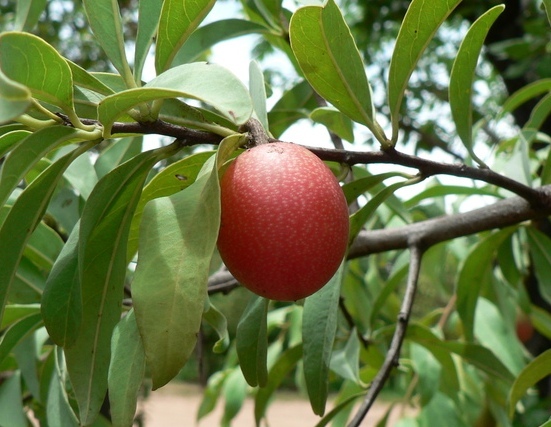 The large sourplum is a small tree or shrub from Africa bearing edible fruits having many traditional uses. 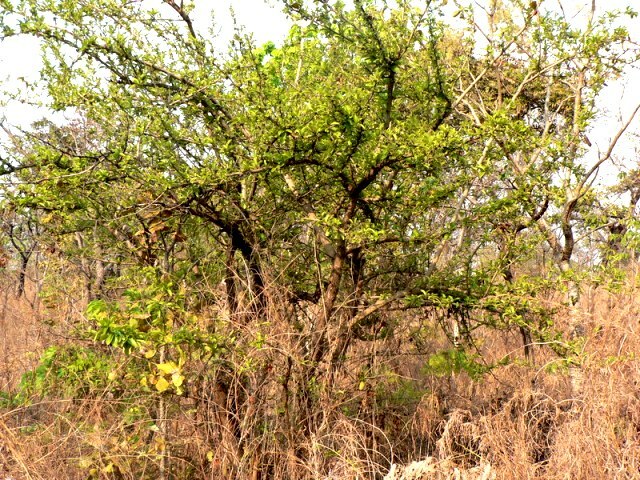 This tree is found in woodlands and grasslands and on rocky outcrops and sometimes on termites mounds. It occurs from Tanzania to South Africa. Large sourplum is a deciduous tree up to 6 m tall with an untidy open crown. The bark is dark grey and rough, but pale green or brown on younger branches. Branchlets are spine-tipped. Sapwood is white and heartwood is hard and reddish brown. The root system is non aggressive. The leathery, dark green leaves are often in clusters (fascicles) on short spur branchlets. They are simple, 60 x 25 mm. 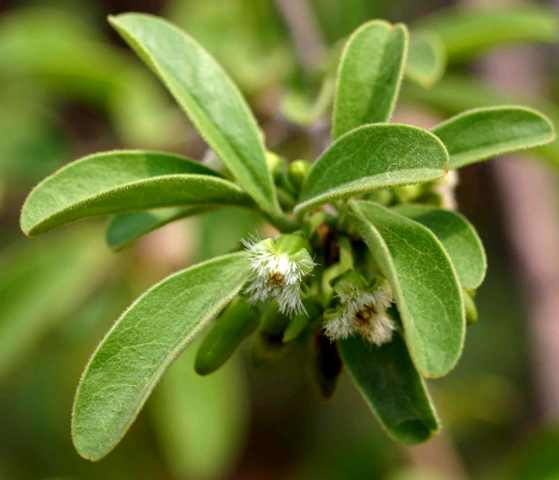 The flowers are small, sweet-scented and creamy green and borne from August to October in single stem clusters in the axils of the spines or on the dwarf branchlets. Fruit is a drupe, thinly fleshy, oval, attractive, which is 25 mm long, glossy deep red with white spots. These are edible, tart but and are relished by people. The single large seed inside contains Ximenia oil which has several uses. Fruits have a refreshing sour taste, best eaten when slightly overripe. These have high vitamin C content and are also is high in potassium and contains protein too. The fruits are also used for making jam, dessert and jelly. They can be added to porridge. The seed contains 65% oil. Oil from the seed is used to soften human skins and for softening animal hides. It is also used for lamps. The nuts are also eaten. A decoction from the leaves is used as a wash to soothe inflamed eyes. Infusions of the roots are used as a remedy for dysentery and diarrhoea and together with the leaves are taken for abdominal pain and bilharziasis. Powdered roots are applied to sores to speed up healing; used in soup, and in beer as an aphrodisiac. Powdered dried leaves are taken orally for fever and infertility, and extracts of the leaves are used as a gargle for tonsillitis, and as a vermifuge. Porridge is made using a decoction of the roots, and eaten once a day for nausea in pregnancy; the root decoction is also taken for infertility. Sour plum is not cultivated for its fruits. It is, however, planted in gardens as a bush clump or as part of a boundary screen. Sour plum can easily grown from fresh seed with a mixture of river sand and compost (5:1). The seeds germinate after 14-30 days and transplanting should take place when the seedlings reach the two-leaf stage. This plant is partly parasitic, and will grow better once in the ground where it can make contact with other plant roots. The growth rate is moderate, up to 0.5 m per year, it can withstand moderate frost and it is drought resistant, but needs sun.